One of the best things about the iPhone 4 is that it packs a lot of power into a small handset. The problem with this is that the smaller a device is, the easier it is to lose. Also the more information we store on the smartphone - such as emails and website login details - the more damaging the loss of the iPhone will be. Kensington has come up with a rather clever method of securing your iPhone 4. 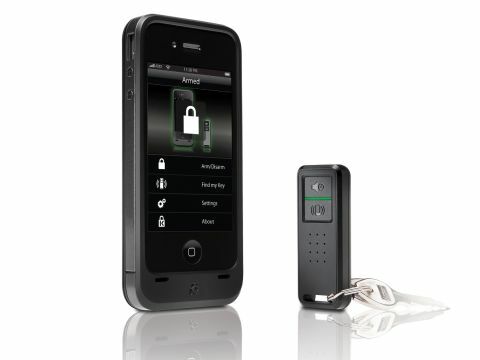 Taking its cues from remote car locking systems, the Kensington BungeeAir Power Wireless Security Tether for iPhone comes with a special iPhone 4 case and key fob. From a distance, you can click to lock the phone remotely. Even better, once you've moved the key fob a certain distance away from the iPhone, an alarm will sound, so you'll be reminded if you've left the phone behind. It works rather well, using wireless 2.4GHz technology, and through the BungeeAir app you can control the distance and other security features. If someone tries to remove the case from the iPhone, the alarm will sound as well, alerting you if your phone is being tampered with. You can also use the key fob to set the phone to ring so you can quickly find it. A great feature is that this works both ways, so if you've lost your keys you can use the iPhone to 'ring' the key fob, helping you locate them. Another nice feature is that the case not only provides security, it can also be charged to provide around three hours of extra battery life. If you're the forgetful type, you might find the Kensington BungeeAir Power Wireless Security Tether for iPhone a very handy piece of kit indeed.